This is a good book for anyone wanting to change their mindset. 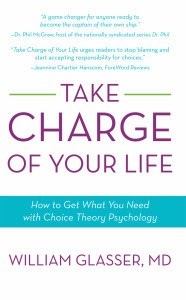 Glasser introduces choice theory which is basically that we have a choice in the way we treat others and ourselves. The proponent is that we have a 'picture' in our minds of the way we want to be or of how we want others to be and all we have to do is change that picture to change what's in our mind. This is choice theory. Basically, it's about learning to stop blaming external sources for the way our lives, or people in our lives, are and look on the inside to change the way we think about things. He gives examples of how the theory can be applied to relationship problems, parenting, and more. In all, this book is a useful tool for anyone looking to change their thinking and, ultimately, their lives. I've heard so many things about this book -- can't wait to read it. Thanks for sharing with us some insights into why and how you wrote it! LOVE this book. Need to see what everyone thinks. I think I need to try a few of those recipes!